ELEGANT DESIGN - The black glass shelf and aluminum cover provide an elegant way of organizing your home theater. EASY EXPANSION - Interlocking brackets allow you to add as many units as needed to carry your devices. HEIGHT ADJUSTABLE - Post-installation adjustments ensure your devices are where you want them. EASY INSTALLATION - Simply mount the wall plate to a single stud, concrete wall or drywall, and attach the shelf. CABLE MANAGEMENT - Hide your cables by routing them along the wall plate. When the holidays come around, you don't deck the halls, you tech the halls. That's why you sang Hallelujah! When you discovered this 3-Shelf Portable Multimedia Cart. Constructed from sturdy steel and coated in luxe black, this rolling stand can be anything you want it to be: a mobile TV stand with wheels, a printer stand, a computer cart, a mobile workstation. Make it the AV shelf of your dreams or lock the wheels and keep it parked as a sharp bar cart. And while its versatility makes it a smart guest at your holiday home gatherings, it also makes your inner a geek a little more neat. 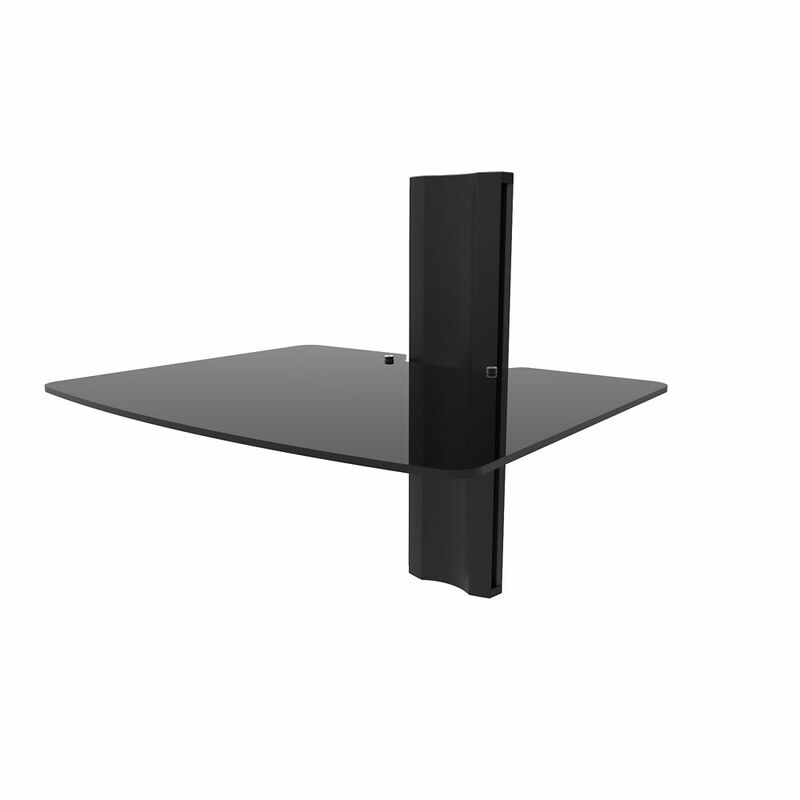 AVT1 Wall Mounted AV Shelf AVT shelves provide an elegant, small footprint solution to organizing your home theater. Mounted to the wall to save space, their modular design gives you the freedom to add as many as needed to carry your PVR, gaming consoles and other A/V devices. Each unit features a tempered glass shelf that is height adjustable and can support up to 20 pounds. A powder coated aluminum cover is also included to hide your cables, while endcaps ensure a clean and refined appearance. Choose between one, two and three-shelf models to accommodate your needs.